Most students don’t realize how useful it is to be aware of social events, news, and important information that occurs on campus at American River College. One of the best ways to be aware of current news and events is by reading The Current, the ARC newspaper, which provides certain news that you can’t get any other way. The Current is ARC’s newspaper and online publication that focuses on campus news pertaining to college students. Why should students read the college newspaper? Being ARC students should be reason enough to want to read the college newspaper. As college students, they could be more involved on our campus just by reading the newspaper and being aware of what goes on at the place that we spend most of our day at. The ARC campus is a second home to most students; if they can use other resources and facilities on campus such as the bookstore, the cafeteria, the library, why should the newspaper be an exception? Different students have different reasons for not reading the newspaper that range from not having enough time to just not being concerned with its content. Chemical dependency major, Tracey Plowman, said she doesn’t currently read the college newspaper due to her busy schedule. Plowman also explained that there have been a couple of major stories that she read over the course of her college life. Computer science major, Joshua Morris also said he didn’t read the newspaper due to lack of time. “It’s not something I normally pick up mostly because I’m here a little bit for classes and then I go to work, and so I’m really just squeezing in school around my work schedule,” Morris said. To “stay current”, Morris reads Reddit for information about what goes on, which doesn’t give information about the ARC campus. “I would be interested in hearing things about students, what they’re doing, and what the campus is doing as a whole” he went on to say. ARC student, Ryan Osborne said he doesn’t constantly read the newspaper although he does on a rare occasion. “It’s good to know some things on campus to be aware of, such as things to look out for and events,” Osborn said. He also talked about his interest in reading stories about things on campus that are not so well known and we don’t hear that much about. Osborne used to work in the Disabled Student Programs and Services office on campus and said he would like to read more news regarding that and other places on campus that go unreported such as the horticulture building and the health center. Sports games are always announced, opinions about issues are expressed, events and major crimes get reported but sometimes there are many parts of campus that don’t get as much attention as some students might like. Aside from the ARC newspaper, other ways to be aware of what goes on at our campus is the online ARC page, through email notifications, information from counselors and professors, and bulletin flyers that can be seen in the halls or passed around on campus. Students should be aware of what goes on around them on campus and be part of the college community that they are in. It’s easy to just come to classes and leave without ever being interested or involved in college life with other students around us. By reading the college newspaper, students can learn more about what happens around them on campus, what other students are involved in, and what they can become part of. 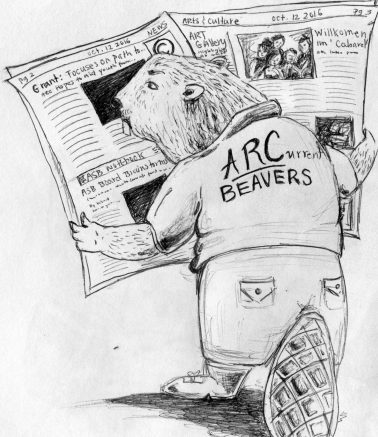 Be the first to comment on "ARC students should read the college newspaper"